Seventy-five years ago, the far-sightedness of Our Founders- Rt. Rev. Henri Caumont and his enthusiastic sister Rev. Mother Mary Matilda worked earnestly for Women’s Education. In the 19th century and early 20th century, our Indian women, specially in Rajasthan, had a glorious past. In spite of it, they were kept behind the purdah. They were married off as children and relegated to the background. Society can never be normal unless men and women play a complimentary role. The labours of our two pioneers laid the foundation of ‘SOPHIA’. It was born on June 29, 1919 and cradled in the present St. Francis Hospital on Beawar road, Ajmer. A well-to-do lady living in the vicinity of the Sisters’ Convent, was fascinated by the Sisters’ devotion to work and requested Rev. Mother Mary Matilda to educate her daughter. Rev. Mother Mary Matilda together with her brother - The Rt. Rev. Henri Caumont planned the starting of a school for the elite, Indian girls of Ajmer of that time. 1919. Regular teaching started on June29, 1919. The first pupils were Kusum Khandwala and Mehru Contractor nee Ghadialli. Kusum was so tiny that she had to be brought in a perarnbulator. All was not smooth sailing. The problem of winning over the public and breaking the traditional customs proved a hurdle. To illustrate this-two girls aged 9 and 4 after two months of registration withdrawn and married off. 1920: ln 192O the strength was 19. Ala Sethna was the first residential pupil. A boarding House was started for out station girls. Another boarder, Mary Stafford, the Late' Sr. Matilda also served the Congregation after completing her studies. The aim of Sophia was to give all-round education to the pupils. A Girl Guide company was formed in 1923 Rev. Mother Matilda was the first lady commissioner of Ajmer. Cooking, Loundry, Embroidery, Cutting and music were made part of the syllabus. 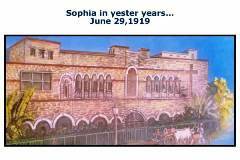 Sophia worked as a private institution till 1926 when the Education Department of Ajmer-Merwara was pleased to recognize it and classed it as a special English public school for Indian Girls. The curriculum was that of the Cambridge Examination - the preliminary – the junior and the senior Cambridge Certificate Examination. 1930 dealt a heavy blow on the Congregation and school, nay even on Ajmer. Rt. Rev. Henri Coumont went to his eternal reward on April 4, 1930. We lost in him a valuable friend, a noble guide, a loving father and an enterprising pioneer. 1934. Sophia, what you see today, moved into Mirshali, a spacious area near the foot-hills of the Aravallis, where the present institution has grown and made vast strides in the field of Education. The number of boarders ranged between 30-40 in the senior classes. They came from all walks of society. Even in those days the Sophia Hostel was a vital part of the school.